His work is included in permanent museum collections and has found a home in some of the finest houses – including the White House collection and the Carter Center in Atlanta, GA.
Every two years, equipment manufactures and distributors and cabinet shop owners gather in Atlanta to introduce, buy, sell, and learn about the latest in professional woodworking equipment. 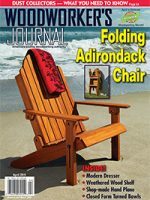 Chris Marshall is a familiar name to readers of both print and online versions of Woodworker’s Journal. Over the past 12 years, he’s established himself as a uniquely accessible author of articles and books. For decades, the selection of new and improved woodworking had been greatly influenced by the annual National Hardware Show.